Down in sunny Essex, we southern softies are unused to heavy snowfall. 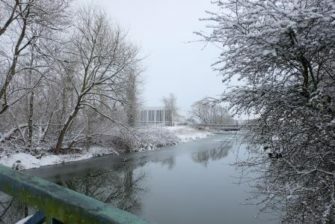 So when we got one on Wednesday 28 February, I wanted to make the most of the opportunity and capture those soundscapes that are only audible in wintry weather, particularly the sound of footsteps walking on snow. I wish I’d had a recorder with me to capture that quiet hush first thing in the morning after a heavy snowfall, but sadly I had to wait until later in the day. The first clip was recorded around 13:10, walking from the Essex Record Office towards the town centre. You’ll hear the wind; aircraft flying overhead; traffic in the background; walking through a tunnel towards the end, and, at around 3m 13s, the sound of a sledge being pulled along the snow. The second clip was recorded at around 17:30, again walking from the Essex Record Office towards the town centre. See if you can pick out when I was walking downhill over the humped bridge.